Looks like it hit a wire fence a little hifill some duco an good as new. No, it’s battered all around. It’s got beautiful paint, but scrapes and dents in the front to match the back, and if you look closely, the rear bumper’s been pushed in also. I’d like to know what the story is. I’m guessing some punks had one helluva joyride. Right. It’s more that I suspect the punks are the owners or are related to the owners. There was probably a heated exchange between at least two people! 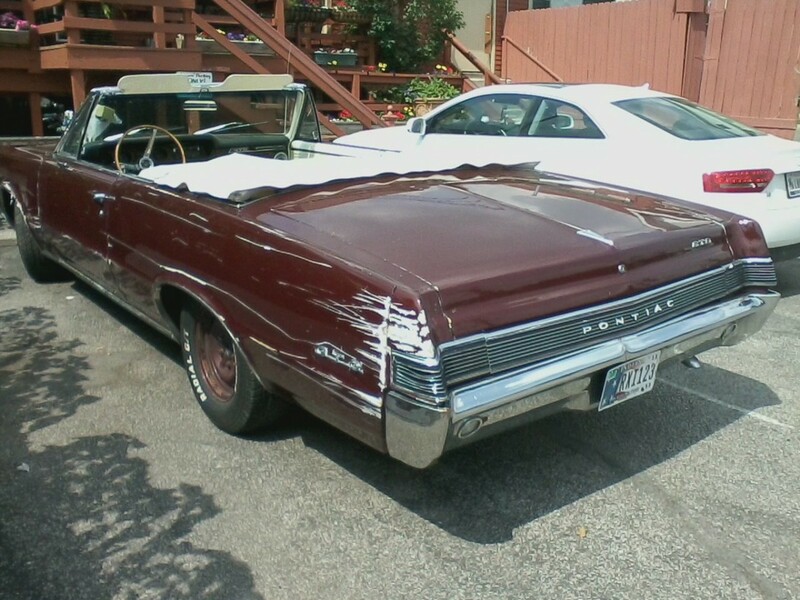 A lot of ’60s Pontiac goodness still shines through the imperfections of almost 50 years. Wish I could say the same about me! At least it’s not HOPELESS, as it would be had it been parked outside during the Great Southeast Pennsylvania Supercell and Hailstorm of May 22. Wow – it’s 1978 again! That’s one, more fun way of looking at it. that’s what Im thinking. Pop in a Marshall Tucker 8-Track and cruise! “Honey I’ve got something to tell you…. Looks like it scraped a white picket fence or perhaps a trailer hit it. Going to assume the paint is not original. It looked to me like the owner is now re-thinking the wisdom of painting his white car burgundy. Before I repaint my Sunfire Yellow ’65 Skylark convertible Seafoam Green, I’m having it media blasted down to bare metal. Car from this era do not handle or brake nearly as well as modern cars do. So if someone has never driven a car from this era they could easily become overwhelmed by its deficiencies. I’ve seen many e-bay ads that look like the driver lost control of the vehicle and crashed into something like a telephone pole. Exactly. This car has more power than it was really designed for too.